Now you can mind more ways of meeting people around you on your mobile app. 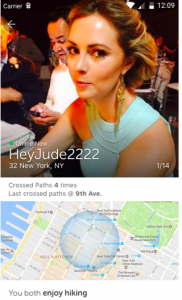 As announced on the Match blog, their new location-based feature, “Missed Connections” will help the 55% of singles that feel technology has made it more difficult to connect with others in real life. 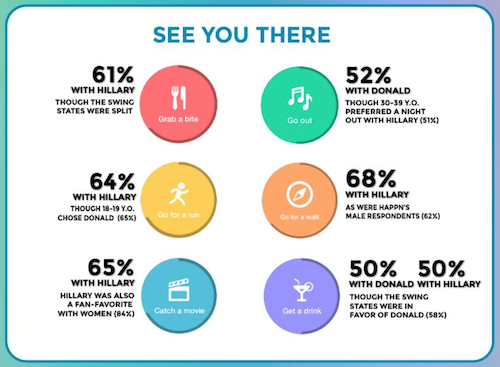 Match wants to reverse this trend by harnessing technology to do what people want to do naturally—meet in real life. Match, who won the Best Dating Site of the Year at the iDate awards, just announced their new feature, with the intent of beineg less creepy that the old Craig’s List “Missed Connections, and similar to Happn’s app, which is solely based on matching you with people you’ve crossed paths with. This new feature on Match will help you fill your date card with singles, AFTER you’ve crossed paths at the same place. The trend of meeting IRL is important to dating apps and sites, to avoid ghosting, breadcrumbing, or just chatting without meeting IRL. Match members will see a Missed Connections introduction page in the app, showing off the feature and asking you to opt-in. Once you’ve opted in, you’ll be able to browse through your recent feed of members you’ve crossed paths with, based on your current matching criteria and your location. The feature now makes geolocation THE priority in your search criteria, revealing the intersection points for your last crossed spot, within one block (such as Prince and Broadway) and the number of times a person has crossed paths with you. Missed Connections now makes it easy to start up a conversation, right within the feed, providing a natural alibi to connect with someone else. Missed Connections helps you meet the person who hangs out at the same coffee shop or dog park; someone with similar interests. With the trend of meeting IRL and taking the relationships offline in 2017, we have high hopes for this feature, but remember, just because you like the same place, doesn’t remove the safety element you should always adhere to when meeting someone from offline, online. Julie Spira is America’s Top Online Dating Expert and Digital Matchmaker. She’s the recipient of the Best Dating Coach of 2017 and has been coaching singles with her Irresistible Dating Profiles programs for over two decades. For dating advice, FOLLOW @JulieSpira on Twitter and Instagram, LIKE us on Facebook, and sign up for the FREE Weekly Flirt newsletter. Is your first name holding you back from getting matches and swipes on Tinder? 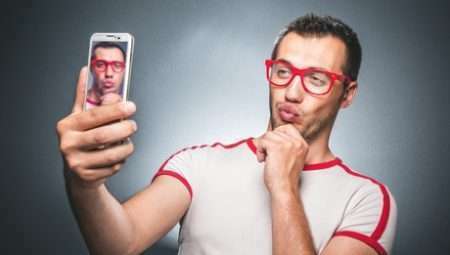 The mobile dating app just released their Top 10 list of the most popular female and male names that are getting the most right swipes in the United States. For those named Hannah, Emma, Lauren, Julia, Emily, Rachel, Samantha, Katie, Anna, or Sarah, congratulations! 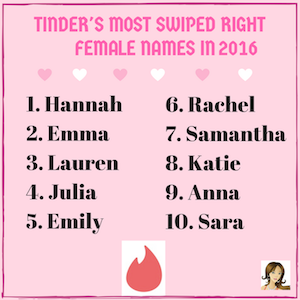 You’ve made the 2016 top swiped list of female names on Tinder. You should have more matches than most, and I challenge you to start chatting, filling your dating card, and meeting IRL. 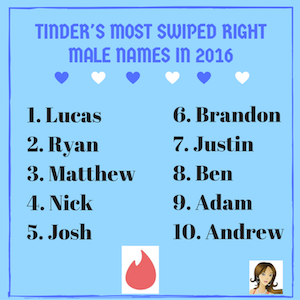 For the guys, if you’re lucky enough to be named Lucas, Ryan, Matthew, Nick, Josh, Brandon, Justin, Ben, Adam, and Andrew, the ladies will be swiping right on your profile more than most. Does this mean you need to change your name? That would sure be confusing if your name is Larry and your profile says “Lucas” to try to attract more swipes. I believe in authenticity, so don’t confuse yourself or your potential date, but if your name is on the list, log on and swipe more often to see if your match numbers increase. Julie Spira is America’s Top Online Dating Dating and Mobile Dating Expert. She was an early adopter of the Internet and is the creator of Mobile Dating BootCamp. As a celebrity dating coach, Julie creates Irresistible Profiles for singles on the dating scene. For dating advice, follow @JulieSpira on Twitter, Instagram, and Facebook. Sign up for the Free Weekly Flirt newsletter delivered to your inbox. Hang tight to your mobile phone this weekend. Whether you’re feeling holiday love or holiday blues, one thing is for sure for singles who’d like to change their relationship status, they’ll be logging on and swiping right BIG TIME over Thanksgiving weekend and it might be a perfect time to reach out to your hometown sweetheart from years ago for a little reunion. 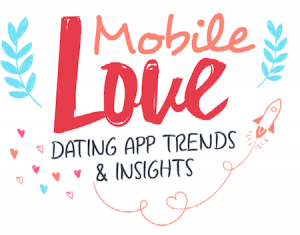 As a mobile dating expert, I always recommend keeping your location based app on to meet new people when you’re traveling or to change your zip code to the destination you’ll be going to in advance on your dating profile. I know it’s difficult being at the Thanksgiving table with your relatives asking you if you’re dating anyone special. Add to it all of the holiday ornaments are going up earlier every year and the need to bundle up is at an all time high. This is why Cuffing season, when couples tend to connect leading up to the holidays has become a relationship phenomenon. Our friends at Tinder have told us use of their mobile dating app increases during Thanksgiving weekend. 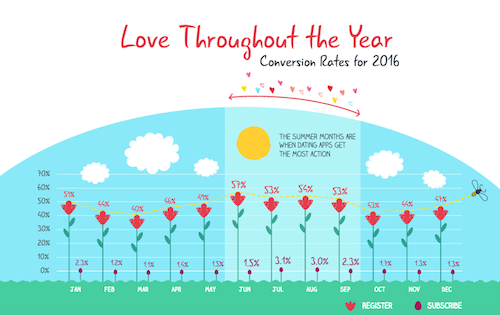 Last year, they reported over 2.3 million swipes in the U.S. with over 17 million matches. That’s an increase of 23% compared to non-holiday weekends. So get ready to log on and swipe big time on your favorite mobile apps including Bumble, Grindr, Tinder, Zoosk, Match, OkCupid and more. So if the family conversation is getting on your nerves, or if you’ve eaten too much turkey, excuse yourself and go into a room and get ready for a swiping frenzy this holiday weekend. If you haven’t hopped on a plane yet, change your search to the city you’ll be spending the holiday in or activate the Passport feature on Tinder to fill up your date card. Remember, this time of year is filled with emotions. It’s also breakup season (ouch). Yes, couples who look deliriously happy on Facebook are breaking up around Thanksgiving and a whole new group of amazing people are feeling like you are. Single again. We featured David McClandess’ Facebook Breakup Chart when it first came out a few years ago, but if you look at the spike in breakups, it starts around Thanksgiving and goes until just before Christmas. This was based on relationship status changes on Facebook. So let your mobile phone be your BFF this holiday weekend and give yourself permission to be attached to the phone before and after dinner. Follow @JulieSpira on Twitter and Instagram for dating advice and love quotes. It appears Bumble has been adding new features to their popular mobile dating app. First they added gifs from gifphy to up users flirt game, which we adore, but aren’t sure how many people are using them. Then it was the BFF, where you can find a friend (non-romantic) to hang out with. I actually saw a billboard on freeway on the way to Coachella, so they’re serious about making it a social networking app. Then they announced that men also had 24 hours to reply to a message from the women to potentially prevent ghosting. 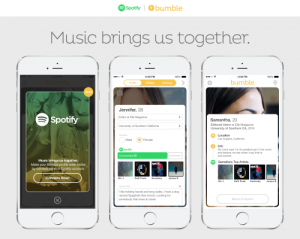 Now on their blog Bumble has announced they will be partnering with Spotify to bring music preference integration to user profiles. This is music to my digital ears and is a marriage I’m quite happy about. We actually recommended Tastebuds as a potential dating app earlier this year for music lovers. Bumble will allow users to connect their Spotify accounts so that potential matches can view their most played artists and see what music tastes they have in common. Bumble CEO and founder, Whitney Wolfe, told TechCrunch, “Music says a lot about who we are as people and connecting culturally can serve a foundation for creating meaningful relationships,” so clearly, it was only a matter of time before Bumble and Spotify teamed up for this new feature. Over the next few weeks, users will be able to connect their Spotify accounts to their profiles. If you’re interested in an artist on someone’s profile, simply click the artist to open Spotify and begin opening your ears (and your heart) to your potential online love’s music taste. 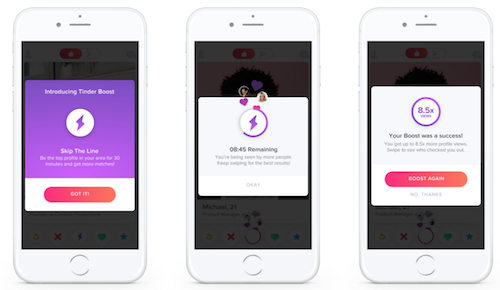 This update will not only provide users with more information about each other before they decide to swipe right or left, but it will also create a conversation starter. “I see Adele is one of your top played artists. What’s your favorite album?” is a great way to delve into your digital crush’s preferences and show interest in what they like to listen to. If you’re worried about guilty pleasure artists or songs you listen to that you wouldn’t want a potential digital crush to see, you have no need to worry. The Verge reported that artists streamed during private listening sessions won’t be counted when calculating who your most listened to artists are. This new Spotify feature will also help put music lovers at ease. If you’ve ever been nervous about handing a new love the AUX cord in the car, now you’ll know their music interests ahead of time and won’t have to spend time worrying if they can be trusted to DJ in the car. Will you be adding Spotify to your Bumble account? 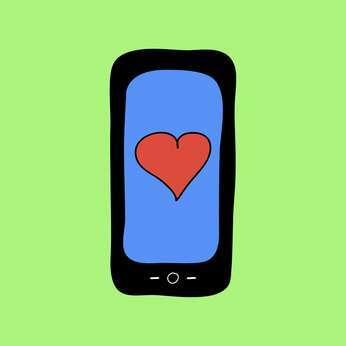 Recently we wrote about non-traditional dating apps that were used to find a date. When Rachel Thompson from Mashable asked me to weigh in on the anxiety singles were having staring at their SO’s ‘last seen’ timestamp on WhatsApp, the popular messaging app purchased by Facebook for $19 million, I wasn’t surprised. In her article, The One WhatsApp Feature Can Make or Break Relationships, Thompson took a deep dive into the activity and hearts of singles wondering if their boo was cheating on them, or to check on someone who might have ghosted them. Ouch, it’s a digital pain that stabs at our hearts. Some singles were staying up until after 3am to see if the person they’ve been dating was awake texting someone. What they knew for sure, is they weren’t the recipient of sweet nothings late at night, or possibly at all that night. 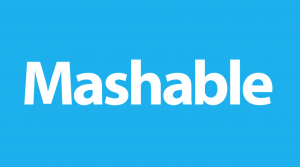 Related: Online Dating Anxiety Disorder: Is it Worse During the Holidays? Where staring at the timestamp becomes a problem, is when someone stalks an ex, is unsure of their relationship status, and these days, more frequently if they’ve suddenly been ghosted and don’t know why. This feature, where you can check up on someone to know there digital whereabouts, helps people stay connected, but It can become very obsessive and isn’t limited to just WhatsApp. Some are checking the last online status on online dating sites such as OkCupid or to see if they have a green button on Facebook chat. This need to cyber stalk gets worse when the person you’ve been checking up on decides change their privacy status to hide their last seen feature, or even takes it a step further and blocks you. Ouch, again. Still, the need to peek can become addictive and it can negatively affect a relationship when one jumps to a digital conclusion about the relationship status solely bases on online activity. It appears WhatsApp is now responsible for many breakups. Are you gazing a little too often at the timestamp feature on WhatsApp? Julie Spira is America’s Top Online Dating Expert and Digital Matchmaker. She was an early adopter of Internet and mobile dating apps. Julie has been coaching singles for over 20 years with her Irresistible Profiles programs. For more dating advice, sign up for the FREE Weekly Flirt newsletter and follow @JulieSpira on Twitter, Instagram, and Facebook.